Rogue One's marketing campaign has made it clear that, while the film will center on mostly new characters, there'll still be some familiar faces in the background. 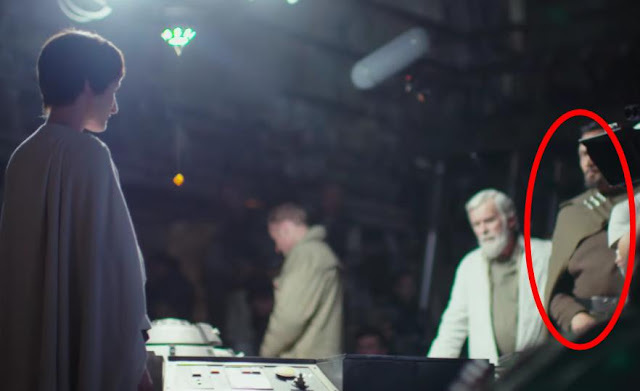 Besides Mon Mothma and Darth Vader (who have both been explicitly featured in the trailers), what other cameos from old Star Wars characters can we expect, and which cameos are less likely? Let's start with one that's already been more-or-less confirmed; back in August, Jimmy Smits revealed that he'll be reprising his role as the Senator and adoptive father of Princess Leia. As a key leader of the Rebellion and a close friend of Mothma's, it's not hard to imagine how Organa would fit into the plot of Rogue One. Probability: Certain, unless (for whatever reason) Organa's scene ends up cut as a result of the behind-the-scenes shakeups. As significant as Bail is, he hardly compares to his strong-willed daughter. After all, she's the one who ends up with the Death Star plans in the opening scenes of A New Hope. And there were even rumors that Rogue One ends mere moments before the beginning of the original Star Wars, in which the Tantive IV (with Leia onboard) is chased by a Star Destroyer. However, don't expect to actually see Leia's face in the film; you wouldn't go to the trouble of recasting a character as famous as Princess Leia for only a single scene, especially if it were the last one. The shock of – without warning – seeing someone other than Carrie Fisher in the role would completely distract the audience from the dramatic weight of the movie's ending. Instead, the final shot of the film could be Leia looking out the bridge of the Tantive IV with her back faced to the audience and her white gown and iconic hair in full view, leaving no doubt as to the identity of this character. The ship's jump to hyperspace would mark the transition to Rogue One's end credits. No, that specific prediction is probably too good to be true. But if the filmmakers want to bring back a truly classic Star Wars character to emphasize the magnitude of the theft of the Death Star plans, Leia would be the obvious choice. 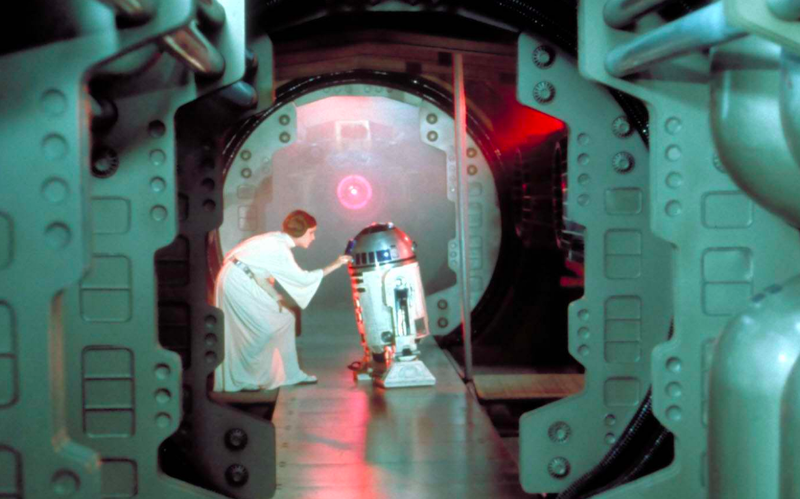 If Leia's going to appear, then what about two other famous Tantive IV passengers? 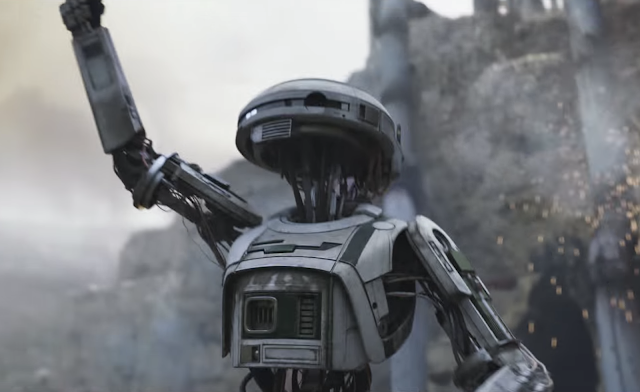 These droids have been in service of the Organa family for almost 20 years, and they play a key role in bringing the Death Star plans to the Rebel base on Yavin 4. 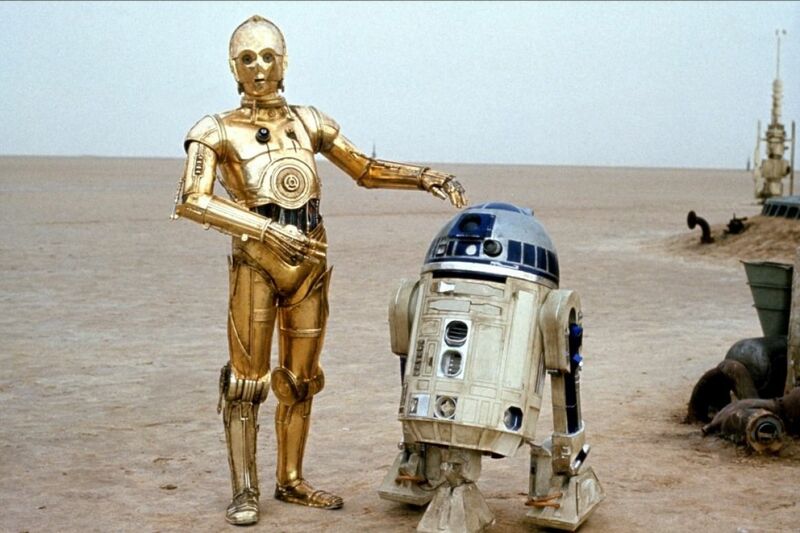 So far, Anthony Daniels has made no indication that he'll be returning to voice/play Threepio in Rogue One. But, like with Leia, a silent cameo could be just as powerful. If the last scene of the film is indeed the Tantive IV's departure, we could see Threepio and Artoo standing right beside the Princess. The only downside of this cameo would be for Duracell. The battery company (accidentally?) hinted at Rey's Force sensitivity in a commercial last year, and fans are already wary of their newest ad, fearing that it's spoiling Artoo's appearance in Rogue One. If it turns out that Duracell actually was prematurely revealing a major Star Wars plot point for the second year in a row, they might have to deal with a mob of angry fans. Probability: Fairly likely, although Duracell should pray otherwise. When we first heard about the basic premise of Rogue One, it was pretty much guaranteed that Wilhuff Tarkin, who commands the Death Star in A New Hope, would have a role in the film. Instead, Orson Krennic is the main villain and the man in charge of the battle station's construction. The relationship between Krennic and Tarkin was clarified by USA Today this week; the two officers are competing for a spot in the Empire's elite top circle. The Death Star must be the key to getting into that club, so if Krennic dies (which is pretty darn likely), Tarkin would take his place. 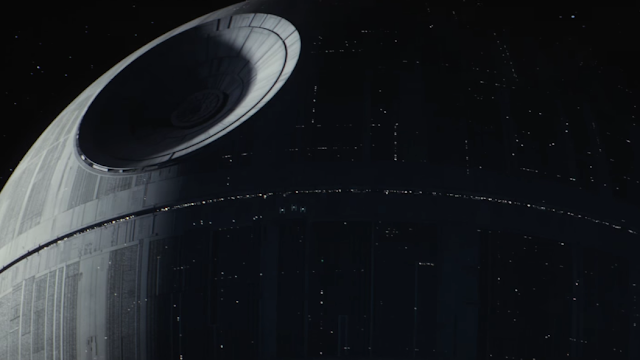 As if that weren't enough evidence, the final trailer had a shot that focused on a single Imperial approaching Krennic on the bridge of the Death Star (seen below). 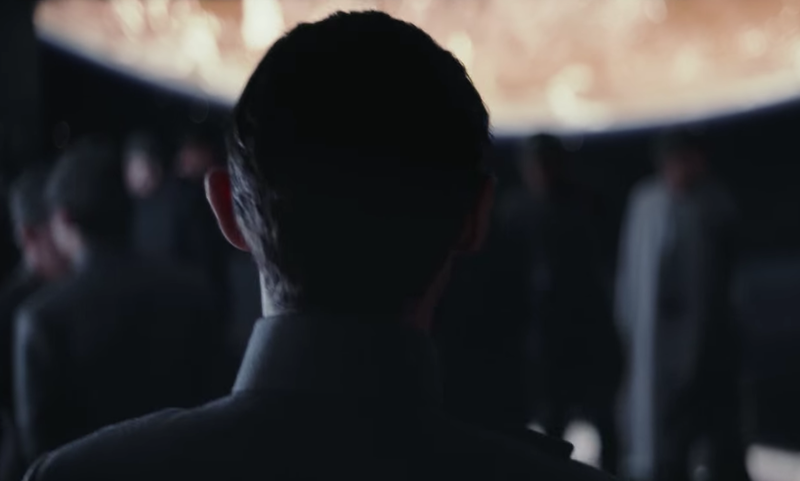 Many fans speculated that this was Tarkin, and since this scene appears to be a congregation of Imperial officers, it would make total sense if the Grand Moff showed up here to have a few words with Krennic. The villains of Rogue One – Krennic, Vader, and (probably) Tarkin – aren't exactly pals, but they all have one thing in common: they answer to Palpatine, the ultimate leader of the Empire. The Death Star is supposed to snuff out any threat of rebellion and secure the Empire's control over the galaxy, so wouldn't Palpatine want to check in on the project? Unfortunately, Ian McDiarmid – who played Palpatine in both Star Wars trilogies – has said that he won't be returning. 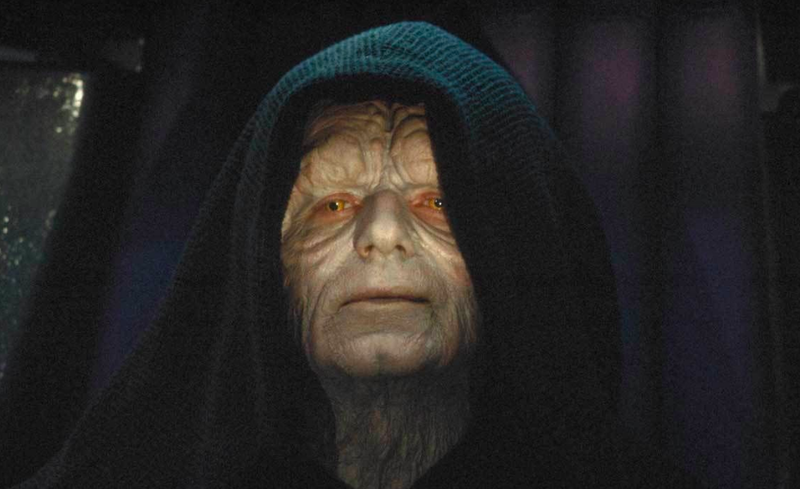 He could be lying (obviously), but unlike Vader and Tarkin, it would be perfectly reasonable if the Emperor's presence in the film was limited to a few name-drops. He's got a whole galaxy to oppress, for crying out loud. The only solid evidence of Palpatine's appearance is a shot (below) from the film's first trailer showing us a hooded figure kneeling next to the Emperor's Royal Guards. 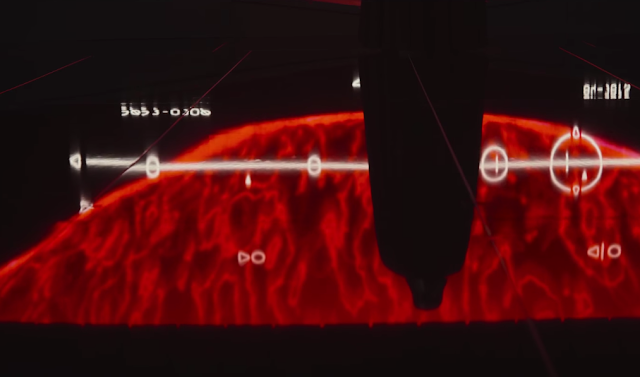 Although the red-robed warriors are never more than a few paces away from Palpatine, we've still not received any explanation for this intriguing visual. 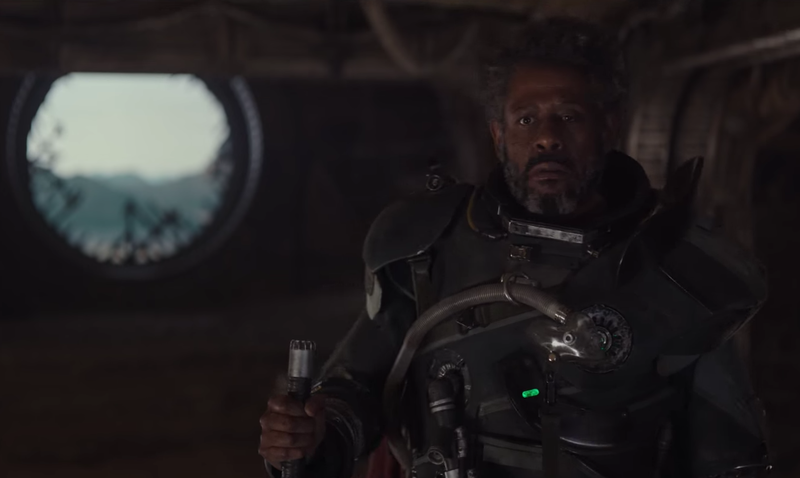 It's possible that this scene has been cut from the film since then, and it'll end up infamous as Rogue One's biggest mystery. 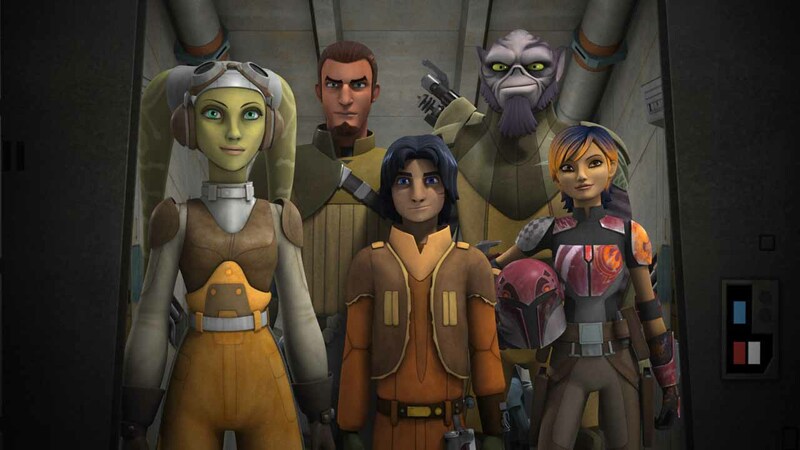 This animated series already takes place in the same time period as Rogue One and stars a team of misfits (including two Jedi) who regularly embark on daring missions against the Empire. Sounds like there's a lot of opportunity for overlap, right? Well, not necessarily. 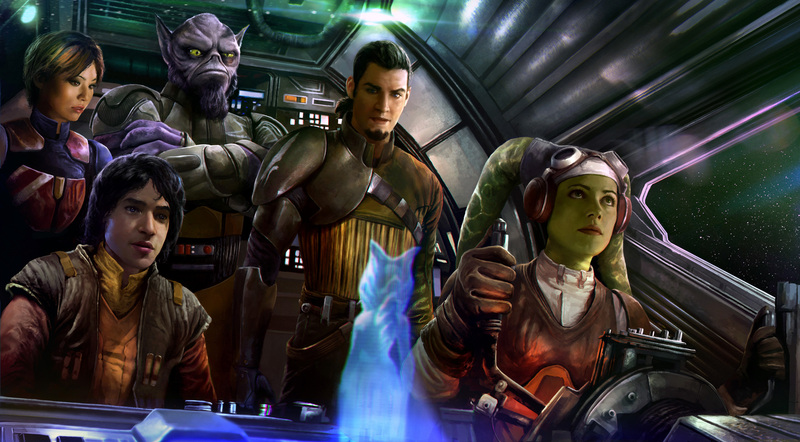 The newest episodes of Rebels are still at least three years before the events of Rogue One, so any kind of cameo or reference would come dangerously close to spoiling the fates of these characters. And they probably wouldn't go to the trouble of bringing an animated character to life (which must be a pretty hard task) for a very brief appearance that only a small fraction of the audience would recognize. At the very most, Rogue One will have some throwaway reference to Captain Syndulla and the secret Rebel base on Atollon. That would be perfectly reasonable considering all that the Rebels crew has done for the Rebellion, and it would satisfy the fans who want some recognition for the series. This rumor was bound to happen. On the surface, Han Solo should have no reason to appear in Rogue One; he wasn't affiliated with the Rebellion whatsoever prior to A New Hope. But Alden Ehrenreich's recent casting as Solo in the character's 2018 spinoff film has led many to speculate that he could first appear in Rogue One. No, it wouldn't be absurd to have Solo pop in for a moment as a friend of a fellow outlaw like Jyn or Baze. But in this case, they would mostly just include the cameo in order to promote the Han Solo movie...which wouldn't make a ton of sense, since it takes place about 10 years before Rogue One. When asked about Solo's presence in the film, director Gareth Edwards said, "I’m not sure if I’m allowed to do this, but I think I should... Han Solo’s not in the movie.” That's not the tone of someone carefully lying to avoid spoiling his own movie. That's the tone of someone who's annoyed about the (false) rumors and wants to definitively shut them down, without the permission or guidance of any of the Lucasfilm executives. The rest of the cameos mentioned in this post are familiar characters who are clearly relevant to the plot of the film. A Han Solo cameo would feel like Lucasfilm telling us, "Hey look, here's your first look at the new version of this iconic character! In two years you'll be able to see a younger version of him in a completely unrelated movie!" Pretty lame. Which of these cameos are you hoping for? Who else do you think could appear in Rogue One? Tell me in the comments or tweet to @SithObserver, and may the Force be with you all. Eight character posters for Rogue One were revealed by the official Star Wars Twitter account this afternoon. Taking a cue from the right part of Jyn's body in last week's theatrical poster, each of these posters has a character's face with the blue diagrams of the Death Star plans spread across them. 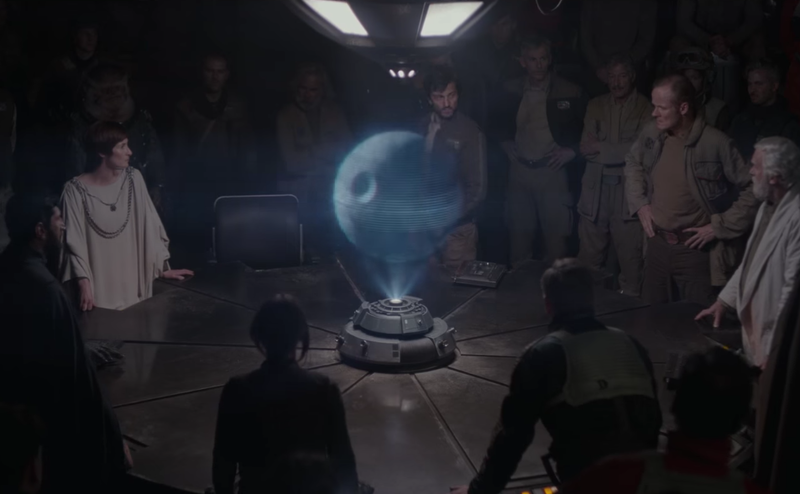 This is a really cool way of showing the Death Star plans and how important they'll be in Rogue One. Although they pretty much motivate the entire plot, they've barely appeared in the marketing so far, or even been mentioned by any of the characters. What do you think of these posters? Tell me in the comments or tweet to @SithObserver, and may the Force be with you all. Rogue One: A Star Wars Story is now barely two months from hitting theaters. The third, final trailer dropped this morning during Good Morning America on ABC. With over two minutes of mostly-new footage, this trailer offers our best look at the film yet. 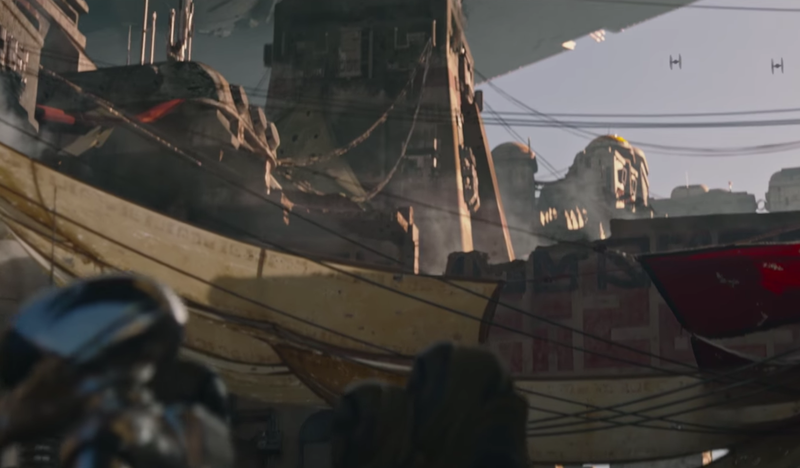 Enjoy our shot-by-shot breakdown of the trailer. The trailer opens on Director Orson Krennic's Imperial shuttle soaring through the sky. Galen Erso watches it land from afar. As expected, this trailer is starting with a look at the film's flashback scenes. Galen owes Krennic a great debt (as the synopsis for Catalyst: A Rogue One Novel told us), and now the Director is coming to collect. He hopes to use Galen's energy expertise to make his secret Imperial project a reality. 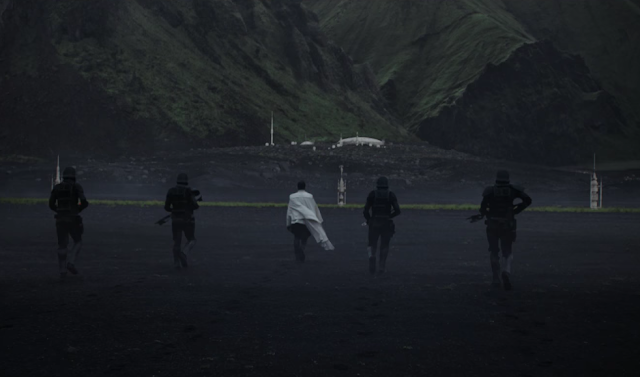 Krennic and his Death Troopers approach the Erso homestead on foot. Yeah, it's a little silly that they land so far away when they could have easily set down right in front of the house and saved themselves a few minutes of walking, but it creates some nice tension as the Erso family rushes to prepare for Krennic's arrival. "Jyn, whatever I do, I do it to protect you. Say you understand," Galen tells his young daughter. "I understand," Jyn replies. That's right, Galen is a regular ol' dad trying to keep his daughter safe. These are some of the last few words that he and Jyn will exchange for over a decade, and they'll certainly repeat in Jyn's head throughout the movie. 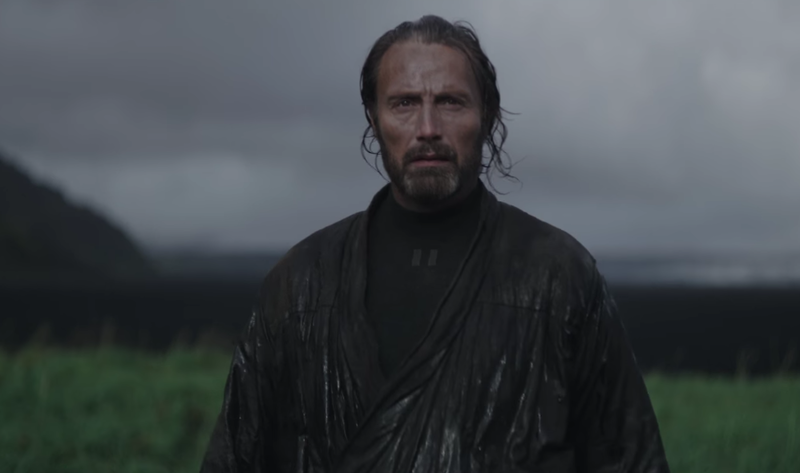 Galen wordlessly confronts Krennic as he finally reaches the homestead. Jyn watches while hiding in the grass. 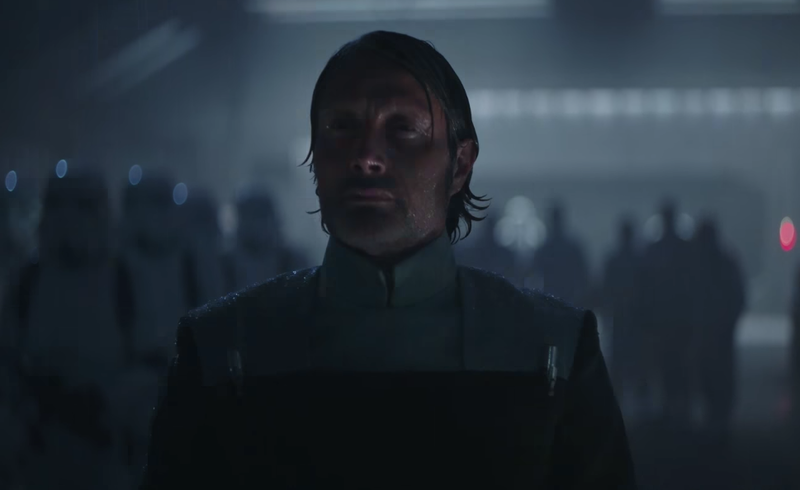 The look that Krennic gives Galen is a telling one; it's almost sympathetic, as if they both knew that this day would come eventually. Jyn suddenly awakes from her dream in an Imperial prison. This is probably how we'll transition from flashbacks to the present day at the very beginning of the film. Hopefully Jyn will have additional dreams later on that will show us more of her troubled past. Rebel soldiers burst into the Imperial prison. "Wanna get out of here?" 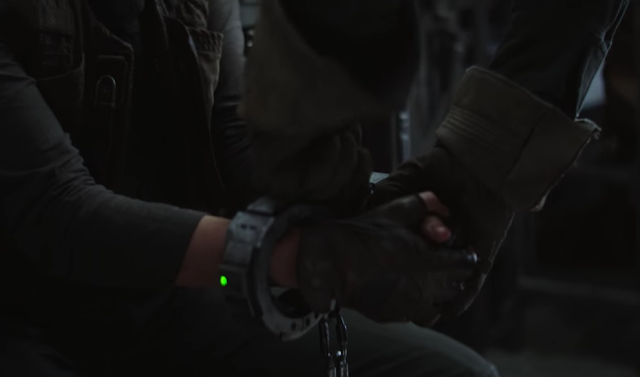 one of them asks Jyn before unlocking her shackles. So this is how she ends up on the Rebels' Yavin 4 base. Unfortunately for her, we've seen that she'll be restrained again when she's brought in front of the Rebel leaders. 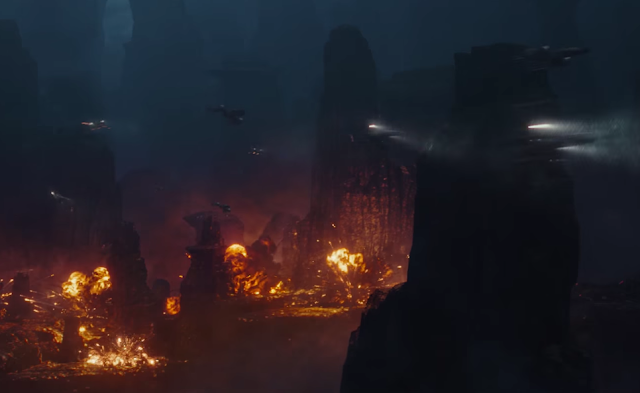 Jyn and Cassian's U-Wing flies over some interesting rock formations on Jedha. No, this isn't just some crazy easter egg. 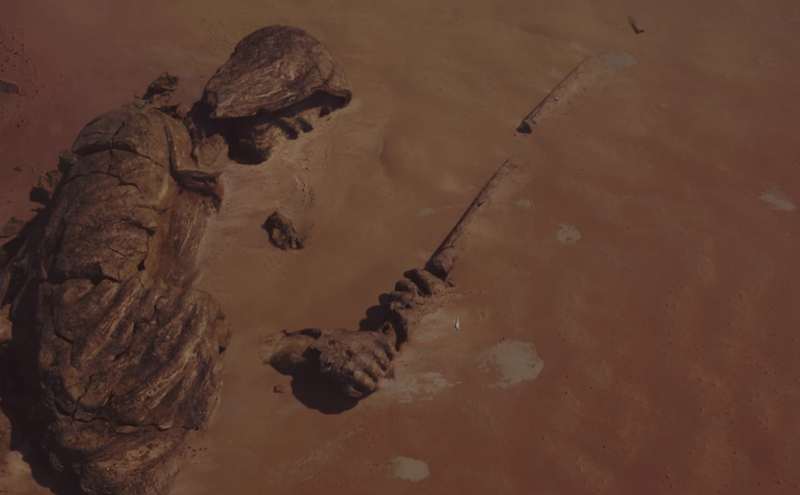 We know that Jedha was important to the Jedi (hence its name), so a giant statue of a Jedi Knight must have been built many years ago, and then toppled when the Empire took over. "Our Rebellion is all that remains to push back the Empire," Mon Mothma says. "We think you might be able to help us." We see Jyn staring out the U-Wing window and then striding through the Yavin 4 hangar. Evidently, Mothma will take a look at Jyn's file and decide that her skills and familial connection could make her a valuable asset. "When was the last time you were in contact with your father?" Cassian asks Jyn. "What is this?" she responds indignantly. Mothma gives her a look. 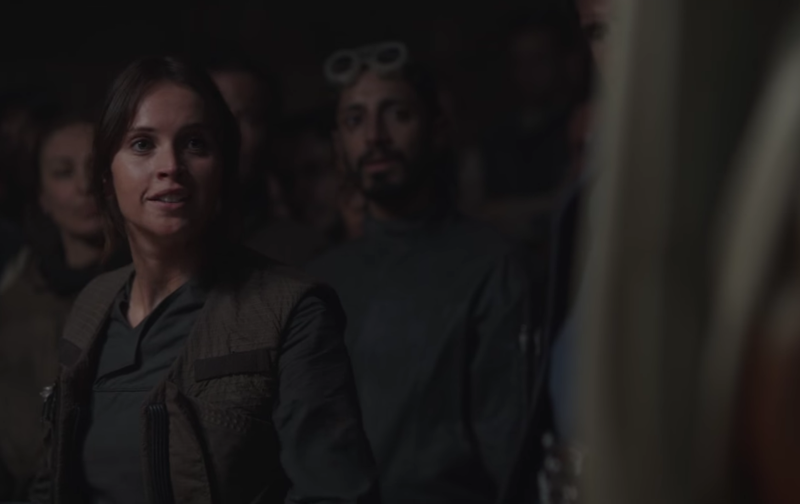 In the previous trailers Jyn was snarky and flippant during this important Rebel meeting ("This is a rebellion, isn't it? I rebel"), but the mention of her father has clearly changed her mood. 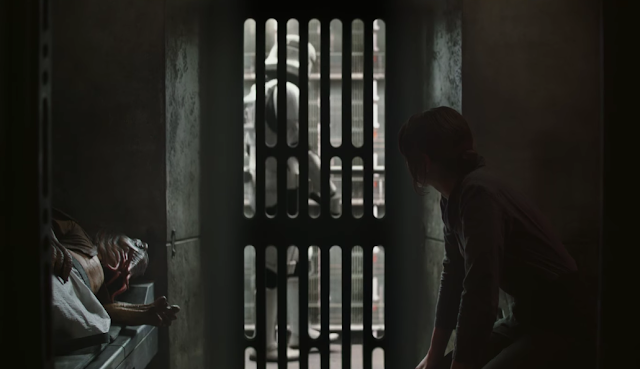 "It appears he's critical to the development of a superweapon," Mothma explains as we see Galen meeting Krennic outside an Imperial facility on Eadu. Jyn processes this. 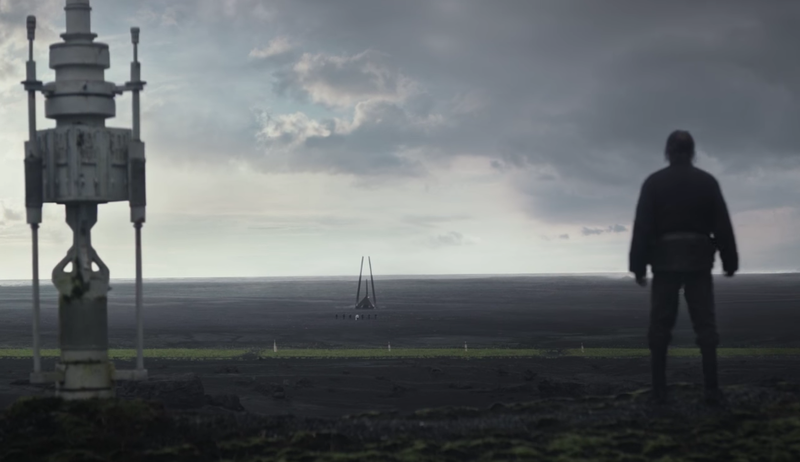 Unlike Jedha, the details on Eadu are pretty sparse, but we know that it's a rainy, canyon-y planet on which the Rebels will attack an Imperial installation that's related to the Death Star construction. 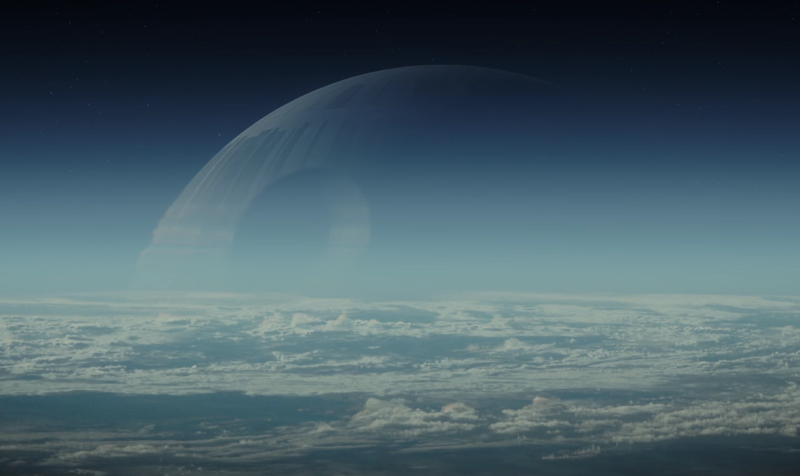 The Death Star floats in the atmosphere of a planet. It really seems like Rogue One is chock full of beautiful Death Star shots; floating upside-down, eclipsing Jedha's sun, and now resting in the clouds. "If my father built this thing, we need to find him," Jyn tells Cassian aboard a U-Wing. This looks like it comes right after a scene in the second trailer, in which their U-Wing avoids a storm of rubble and Cassian jumps them to hyperspace. 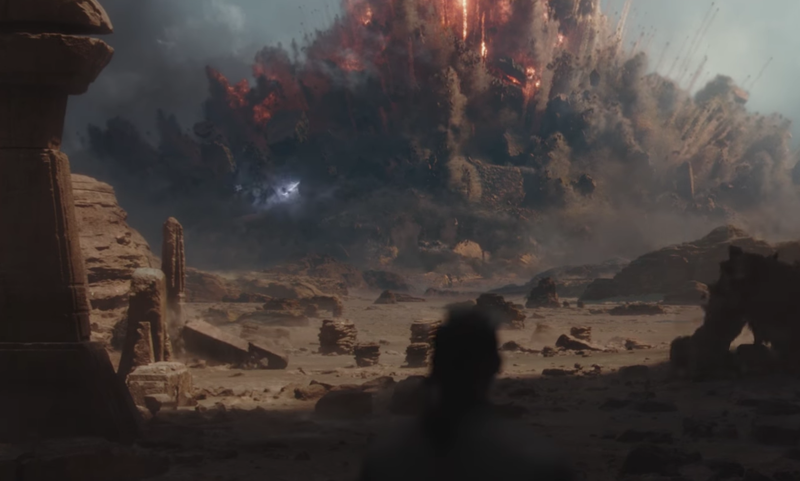 Jyn's new urgency could be a result of Jedha's (very) recent destruction by the Death Star's laser. "All right, how many do we need?" 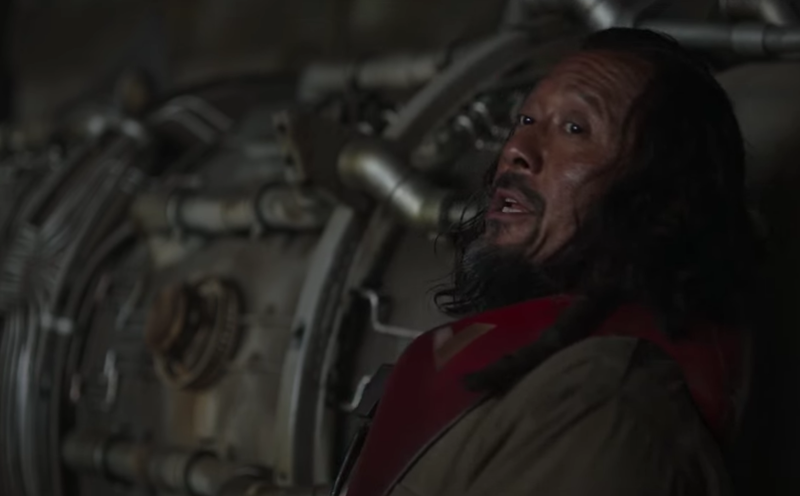 Baze asks while inspecting an engine. Chirrut grins. 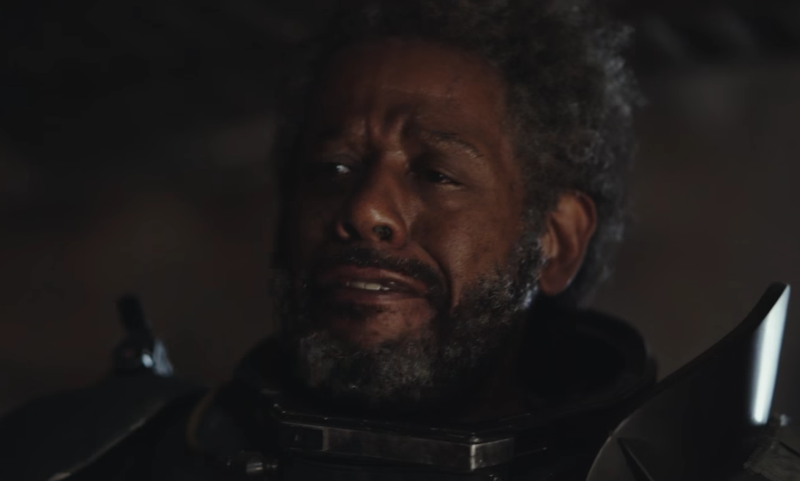 This is meant to show us that Rogue One will still have lighthearted moments between the Rebel crew, even if their mission is pretty darn serious. 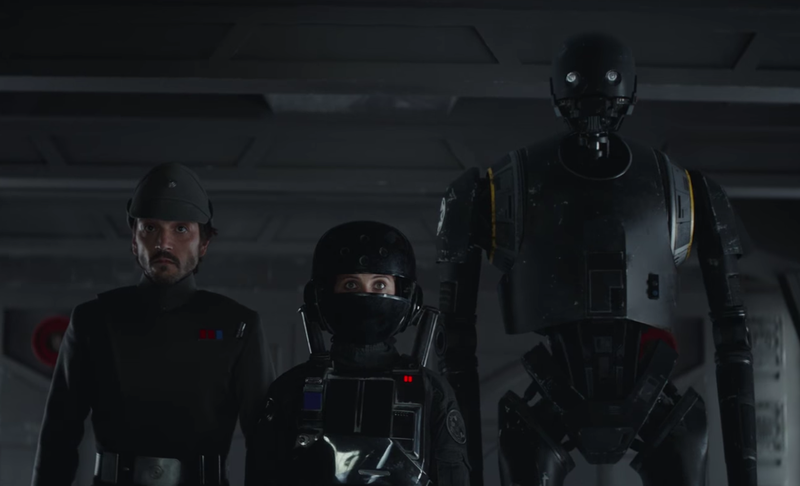 "They're requesting a call sign," K-2SO informs the team. "It's um, Rogue. Rogue One," Bodhi replies. Jyn looks over with confidence. Yep. That's the name of the movie. They just said the name of the movie. Try not to freak out, people. 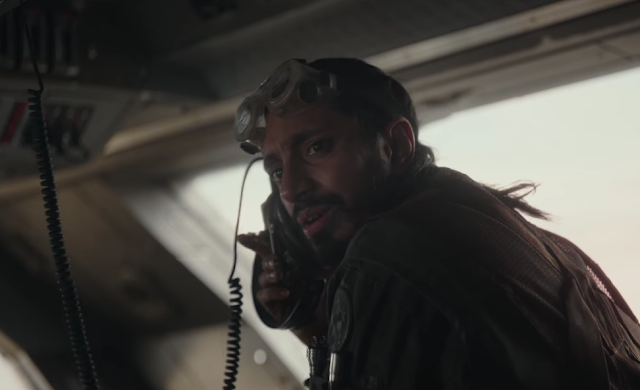 Turns out "Rogue One" actually has some significance in the plot of the film. Darth Vader's reflection spreads across the floor. 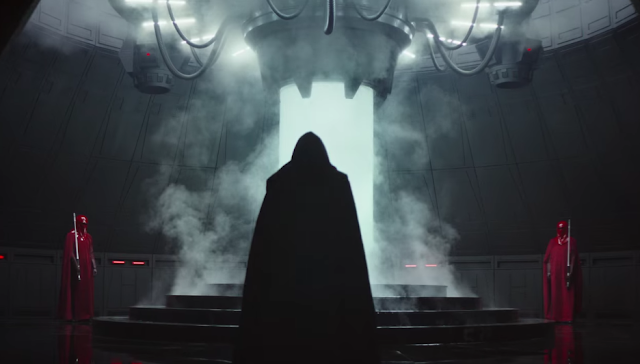 This is hardly the Sith Lord's most notable appearance in this trailer, but anyone who saw the Celebration-exclusive trailer will recognize this as the film's very first Vader tease. It's nice that they've managed to sneak it into an official trailer. 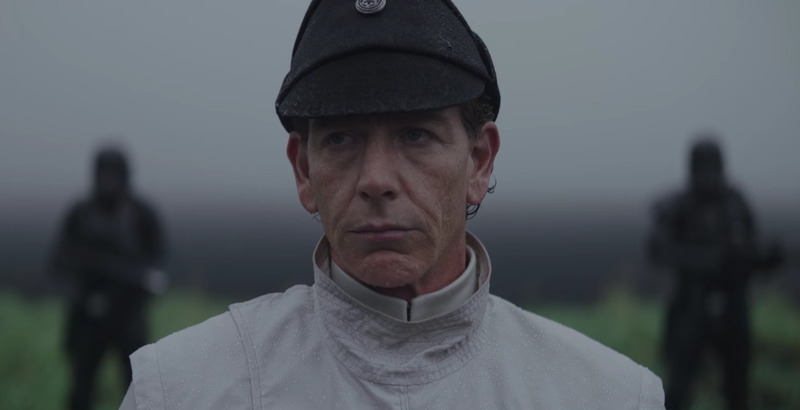 "The power that we are dealing with here is immeasurable," Krennic assures Vader. TIE fighters fly past the Death Star. 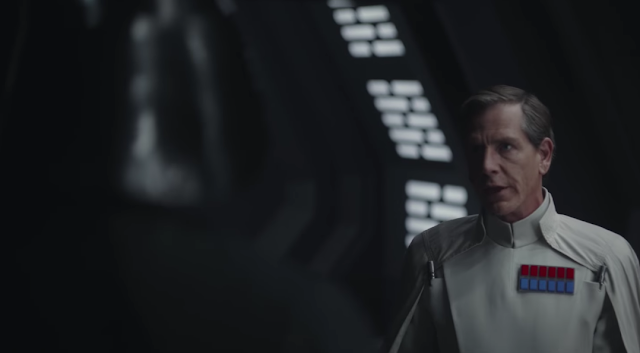 Director Gareth Edwards mentioned that Vader has a piece of dialogue with chilling emphasis on the word "power"; perhaps he flings some of Krennic's words back at him in this scene, to remind the ambitious leader of who's really holding the power here. "If the Empire has this kind of power, what chance do we have?" a senator asks as a group of Rebel leaders and politicians gather around a Death Star hologram. This is just the latest in a long line of Star Wars "everyone crowds around a projection of a giant death sphere" scenes. Chances are that Bail Organa's cameo will also be during this scene. 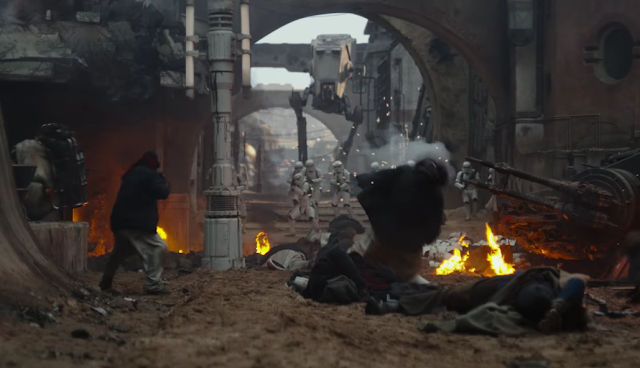 Stormtroopers and an AT-ST blast Rebels on a Jedha street. Jyn and Cassian rush into the action. This Kyber crystal-rich moon is also a major site of rebellion. It's where Chirrut and Baze join the team, and where Jyn will seek out the help of Rebel extremist Saw Gerrera. Saw limps up with a robotic leg. This is our best look yet (besides the toys) of the injuries that Saw has sustained. He's missing a limb and probably doesn't look too good underneath that suit. In short, he's learned the cost of rebellion the hard way. 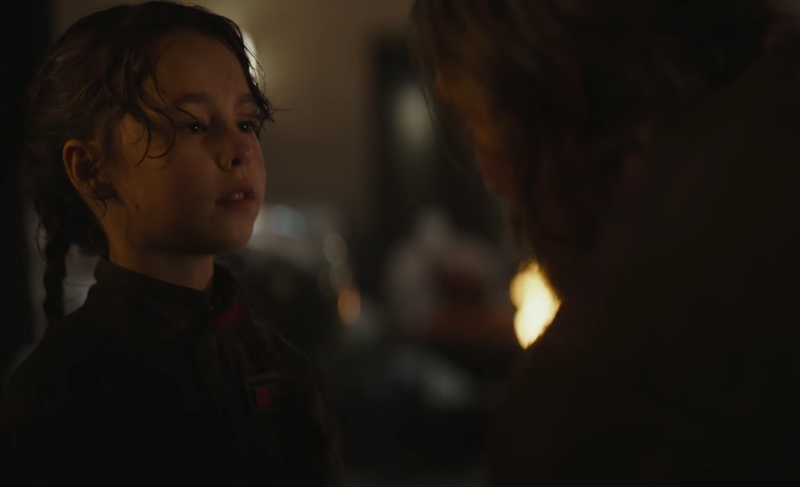 "We have hope," Jyn replies to the senator. "Rebellions are built on hope!" The group of Rebels smile and nod in approval. Wow, it's almost as if she read the movie's tagline! 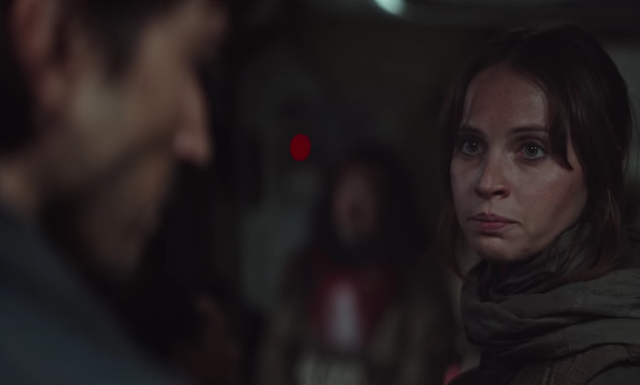 As THR pointed out, this version of Jyn is more of an encouraging optimist than the angry, abrasive character we saw in the first trailer. 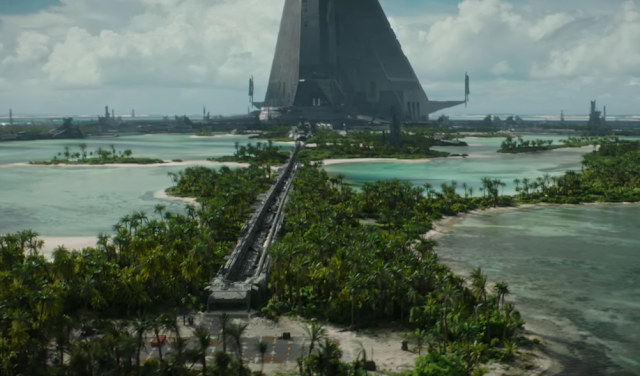 We get a good look at the Scarif landscape. Rebel soldiers run through the jungle. A beautiful, tropical planet that's been transformed into a major Imperial construction site is a fascinating place for a final battle. "They've no idea we're coming," Jyn says. Cassian and Jyn, disguised as an Imperial officer and technician, respectively, enter the Imperial facility with K-2SO. Yep, Rebels just love to play dress-up when infiltrating enemy bases. Kaytoo doesn't need a disguise since he's still got the Imperial insignia on his arm. 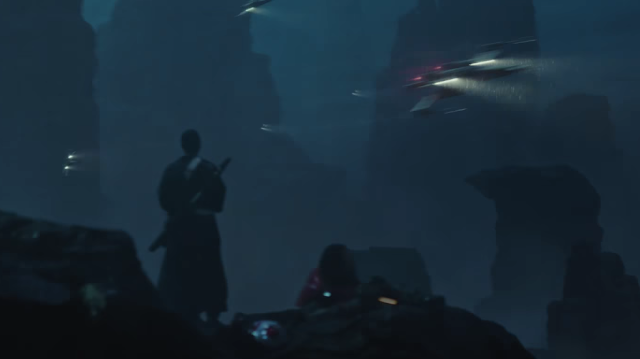 Chirrut and Baze watch as X-Wings fly past them in the rainy Eadu canyon. "Take hold of this moment. The Force is strong!" Chirrut says aboard the U-Wing. The second trailer saw Baze sniping some stormtroopers in the same environment; maybe they're just sent to clear the way for the air support. 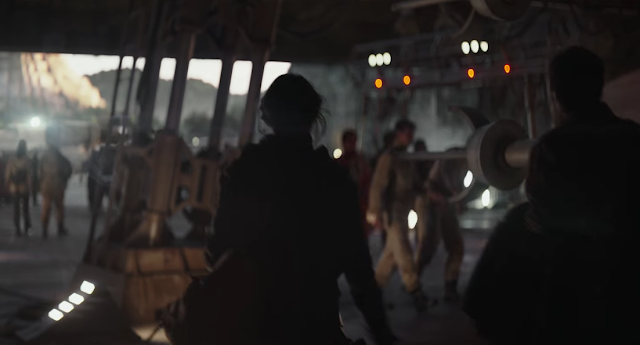 Edrio Two Tubes and several other individuals look armed and dangerous on Jedha. This is Saw's gang, the guys who fight the Empire with guerrilla warfare. They're probably apprehending the Rebel heroes in this scene and plan to take them to Saw. On the Jedha street, Chirrut knocks down a stormtrooper with his staff and Baze shoots down the rest. This is our first look at how these best friends fight together on the battlefield. 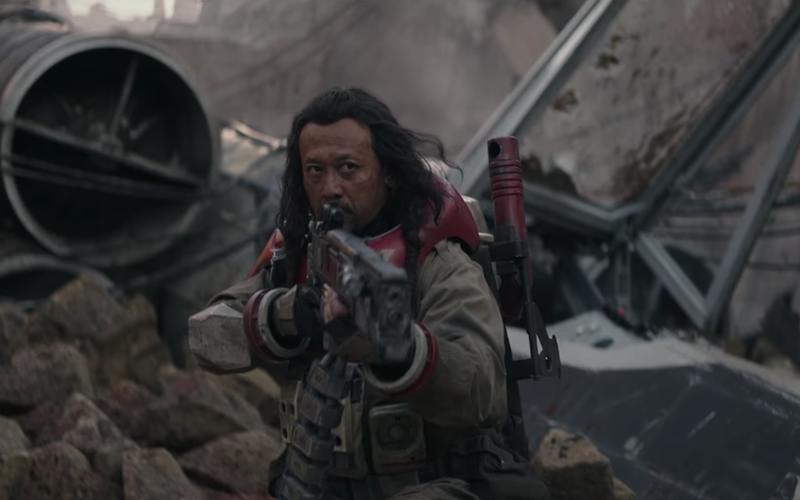 Chirrut doesn't need to be able to see when his sharpshooting partner always has his back. "Make ten men feel like a hundred," Cassian encourages. He runs through the rain on Eadu as starfighters battle above. All the explosions here, as well as the presence of A-Wings, suggests that the Rebels are bombing this Imperial facility. Let's just hope Galen gets out first. 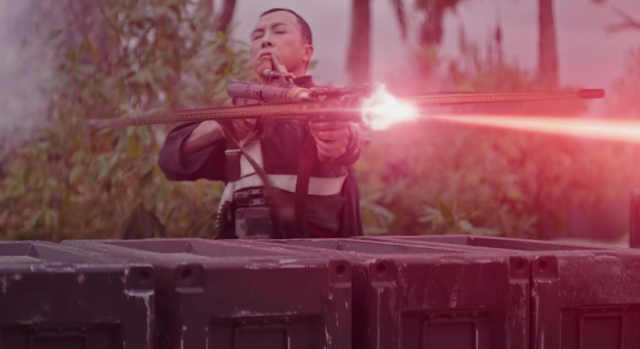 Chirrut fires his bowcaster at charging stormtroopers and shoretroopers on the Scarif beach. Bodhi finds cover and then dodges lasers as he runs towards a starship. Chirrut's blind and doesn't even have real Force sensitivity, but he can probably land a few shots just by relying on his hearing and aiming in the direction of the loud stormtrooper footsteps. "We'll take the next chance, and the next," Jyn says as X-Wings attack an Imperial space station. 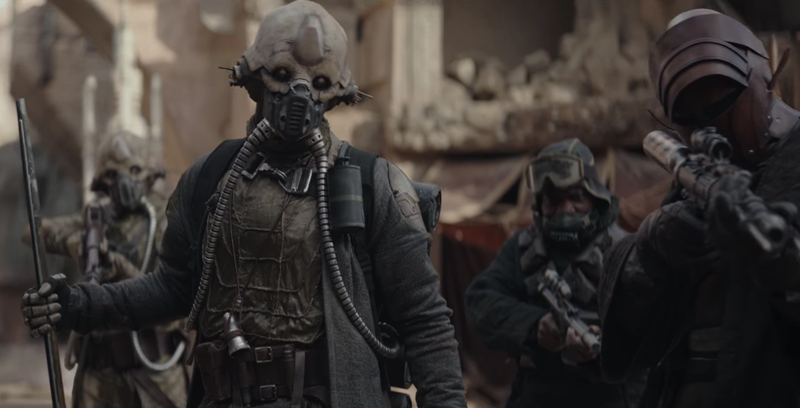 This is supposed to promise us that there'll be more opportunities for them to "make a real difference" (as Jyn herself said in the second trailer), but many of these guys might not survive the first one. 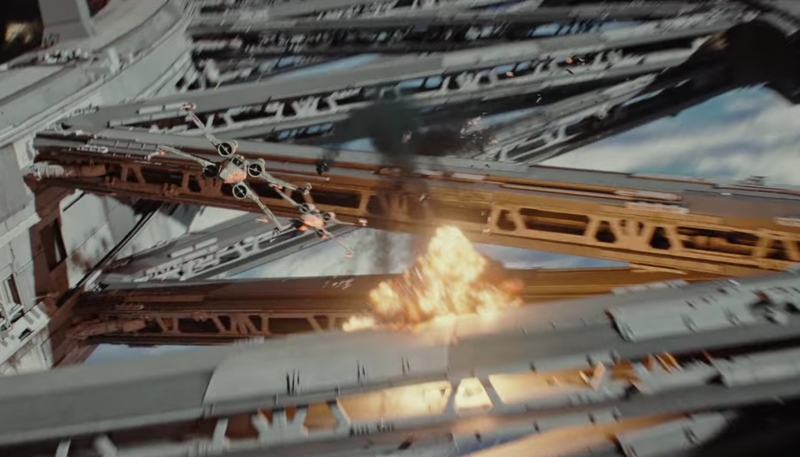 It's also great that we'll be getting a true Star Wars space battle, since The Force Awakens technically had none. We see an explosion on the Eadu base. Kaytoo pilots an Imperial transport and opens fire. "You're all rebels, aren't you?" 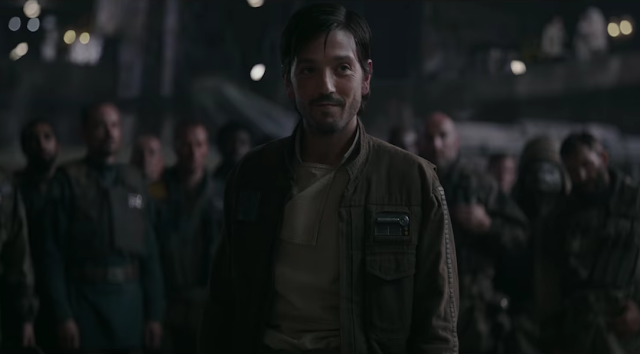 Jyn asks Cassian and a group of Rebel soldiers. 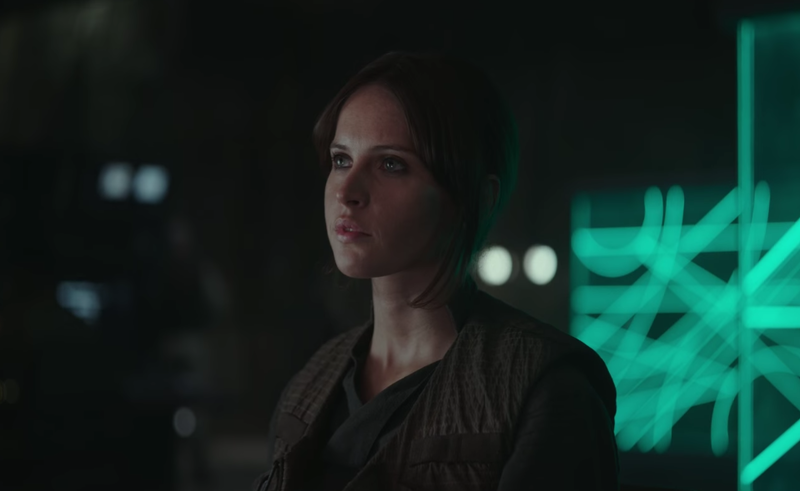 One of the film's sub-plots will be Jyn's transition from a nasty delinquent to a pep-talking leader. She's become a rebel with a cause. Bodhi watches a huge explosion Jedha. If there was any doubt that this moon is going to get blown up, it's gone now. Sorry, Chirrut and Baze, I guess you'll have to find a new home. 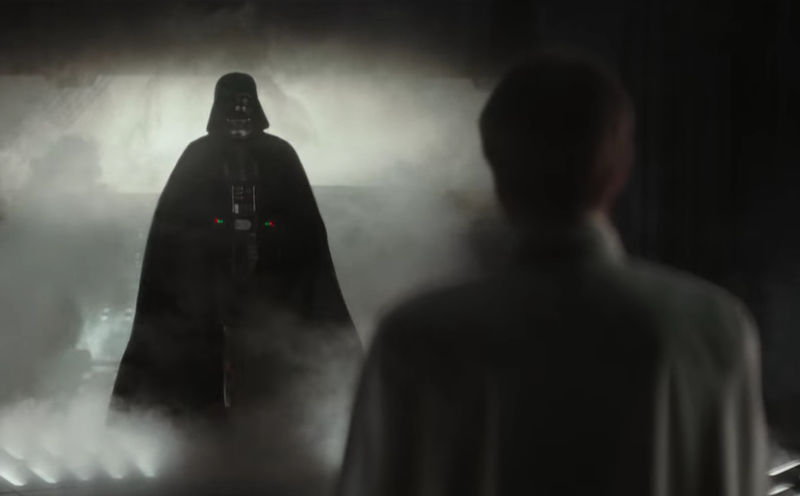 Vader strides through smoke to confront Krennic. 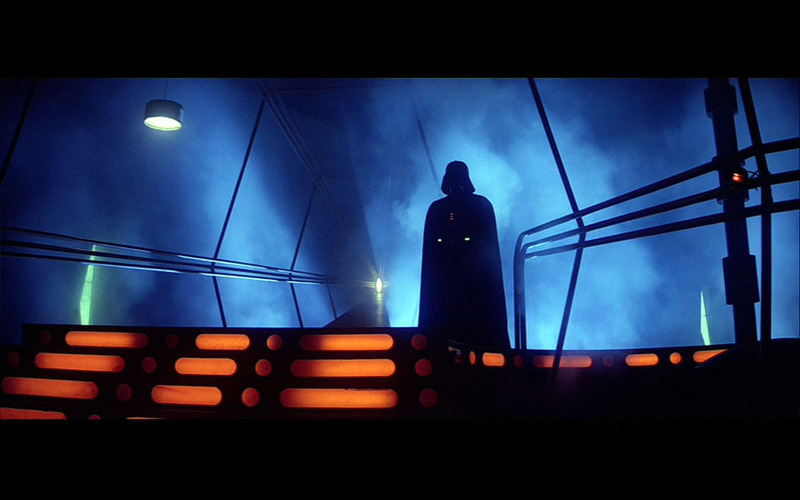 This is (certainly by no coincidence) very reminiscent of Vader's appearance in a similarly smoky room in The Empire Strikes Back. 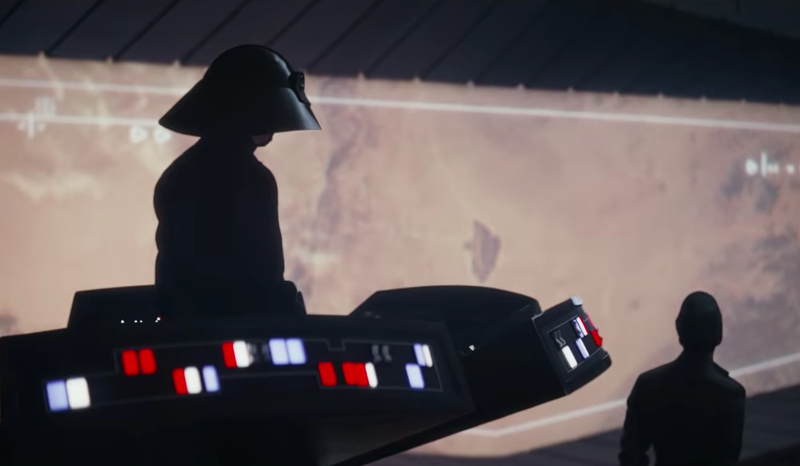 He doesn't look too happy with Krennic by the way he's walking, meaning that this might be the Director's final moment in the film. Galen looks up at someone while kneeling on the wet floor. The out-of-focus figure resembles Krennic with his white collar, and we've already determined that Galen is going to die in Rogue One. 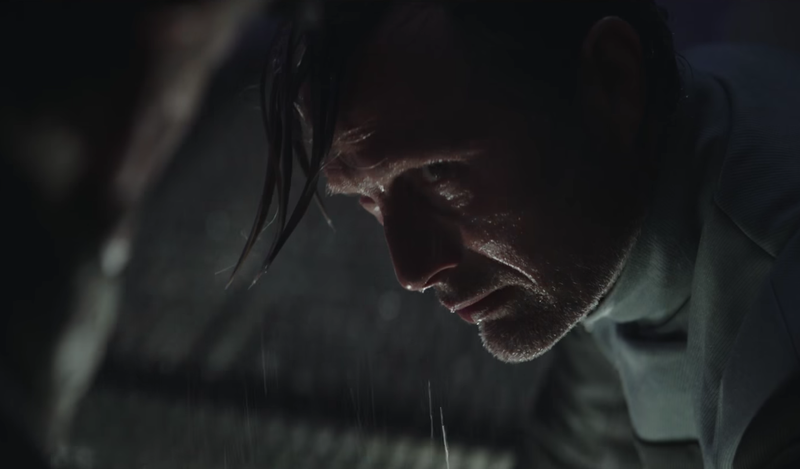 This could be Galen's last scene as he defies Krennic and finally stands up for himself, costing him his life. "Save the Rebellion! Save the dream!" Saw cries. This is such a powerful moment for him, especially given what we already know about him from The Clone Wars. He's watching as his own dreams of freedom and resistance are passed down to Jyn, and he's asking her to preserve them. A U-Wing flies over the Scarif battlefield. Baze and Chirrut avoid the crushing legs of an AT-ACT walker. 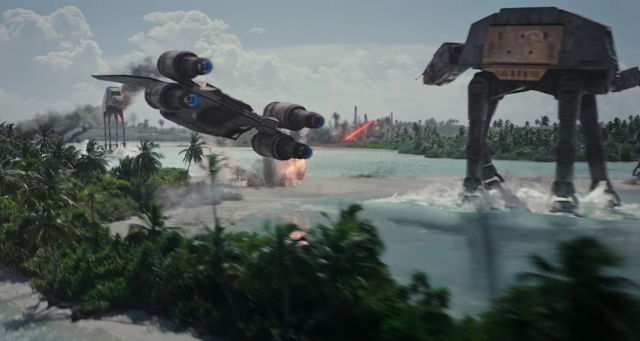 The Battle of Scarif is sure looking like an awesome one. This final shot demonstrates the kind of thrilling action that Edwards, who directed Godzilla, will bring to the film; he's good at showing regular people running away from big, scary things. This trailer also did an excellent job of showing us more Darth Vader without actually spoiling any of his role in the plot. The only new thing we learned is that Vader will have interactions with Krennic, which was already very easy to predict. What did you think of this trailer? How excited are you for Rogue One? Tell me in the comments or tweet to @SithObserver, and may the Force be with you all.